New Limited-Edition Prints Now Available! Below, I've selected some of Lange’s photos from the National Archives—including the captions she wrote—pairing them with quotes from people who were imprisoned in the camps, as quoted in the excellent book, Impounded: Dorothea Lange and the Censored Images of Japanese American Internment. I’ve also made a limited number of prints of her photos available for sale at Anchor Editions, and I’m donating 50% of the proceeds to two organizations fighting to protect immigrants: NILC and ACLU. Their fight seems especially important today given the current tide of anti-immigrant rhetoric, Muslim immigration bans, and the United States terminating DACA, which—if Congress does not pass the Dream Act—means 800,000 immigrants could lose their protected status. This photo essay was originally published on December 7, 2016, the 75th anniversary of the attack on Pearl Harbor. We’ve updated it this year, as the organizations we’re supporting continue to need your help. This month, print sale proceeds going to the NILC will be matched dollar-for-dollar by other NILC donors, so the NILC will get 100% of the value of any prints you order in December! May 8, 1942 — Hayward, California. Grandfather of Japanese ancestry waiting at local park for the arrival of evacuation bus which will take him and other evacuees to the Tanforan Assembly center. He was engaged in the Cleaning and Dyeing business in Hayward for many years. April 28, 1942 — Byron, California. These field laborers of Japanese ancestry at Wartime Civil Control Administration Control Station are receiving final instructions regarding their evacuation to an Assembly center in three days. PRINT AVAILABLE May 6, 1942 — Oakland, California. Kimiko Kitagaki, young evacuee guarding the family baggage prior to departure by bus in one half hour to Tanforan Assembly center. Her father was, until evacuation, in the cleaning and dyeing business. PRINT AVAILABLE May 2, 1942 — Byron, California. Third generation of American children of Japanese ancestry in crowd awaiting the arrival of the next bus which will take them from their homes to the Assembly center. PRINT AVAILABLE April 28, 1942 — Byron, California. 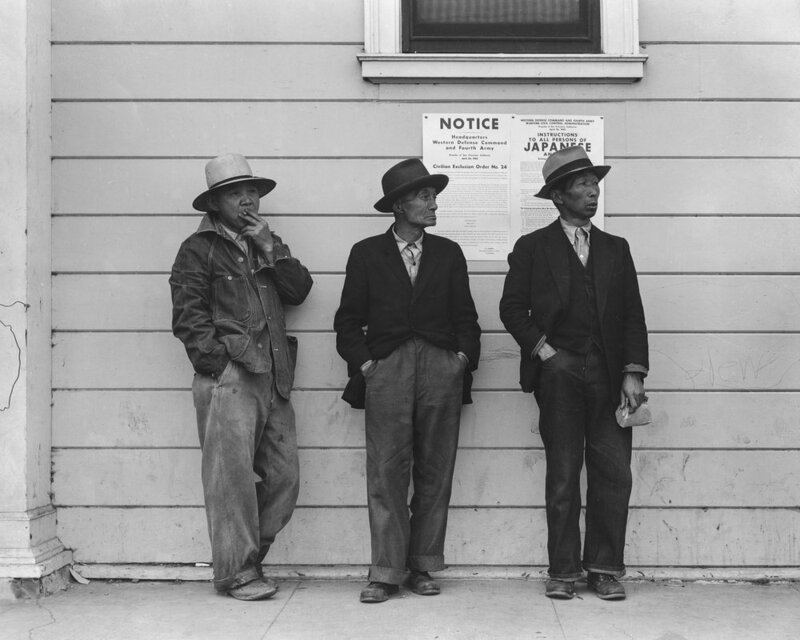 Field laborers of Japanese ancestry in front of Wartime Civil Control Administration station where they have come for instructions and assistance in regard to their evacuation due in three days under Civilian Exclusion Order Number 24. This order affects 850 persons in this area. The men are now waiting for the truck which will take them, with the rest of the field crew, back to the large-scale delta ranch. Sacramento, California. Harvey Akio Itano, 21, 1942 graduate from the University of California where he received his Bachelor of Science [in] Chemistry degree. He was chosen by the faculty as University Medalist for 1942 and was a member of Phi Beta Kappa and Sigma Xi. Mr. Itano went to the Assembly center prior to the commencement exercises at which President Robert Gordon Sproul said, "He cannot be here with us today. His country has called him elsewhere". Mr. Itano hopes to enter the field of medicine and has taken his books with him to the Center where he is spending the duration. Berkeley, California (2903 Harper Street). George and Michiko Uchido with their bridal party prior to evacuation to Tanforan Center. PRINT AVAILABLE San Leandro, California. 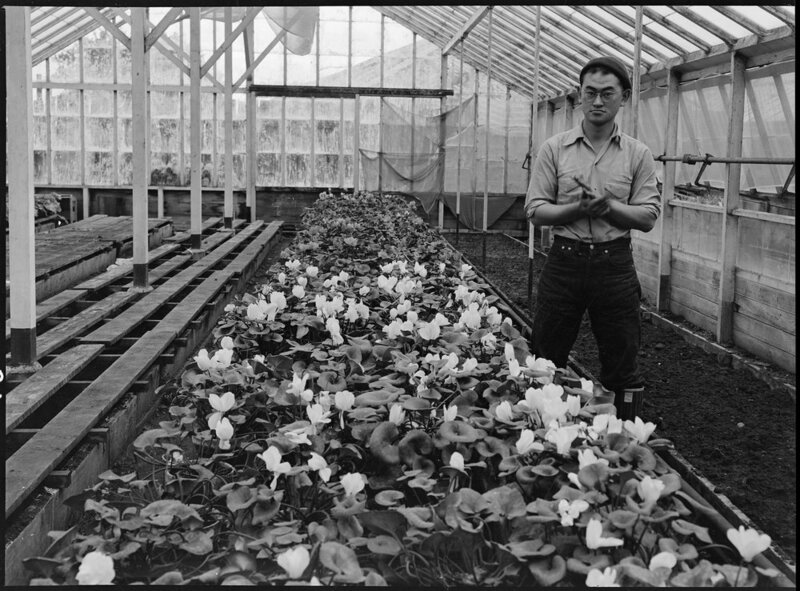 Greenhouse on nursery operated, before evacuation, by horticultural experts of Japanese ancestry. Many of the Nisei (born in this country) attended leading agricultural colleges such as that at Cornell. Evacuees will be housed in War Relocation Authority centers for the duration. Centerville, California. Harvesting cauliflower on a ranch near Centerville on April 9, 1942, while evacuation of persons of Japanese descent was in progress. Evacuees will be housed in War Relocation Authority centers for the duration. Mountain View, California. Members of the Shibuya family are pictured at their home before evacuation. The father and the mother were born in Japan and came to this country in 1904. At that time the father had 0 in cash and a basket of clothes. He later built a prosperous business of raising select varieties of chrysanthemums which he shipped to eastern markets under his own trade name. Six children in the family were born in the United States. The four older children attended leading California Universities. Evacuees of Japanese ancestry will be housed in War Relocation Authority Centers for the duration. Oakland, California. 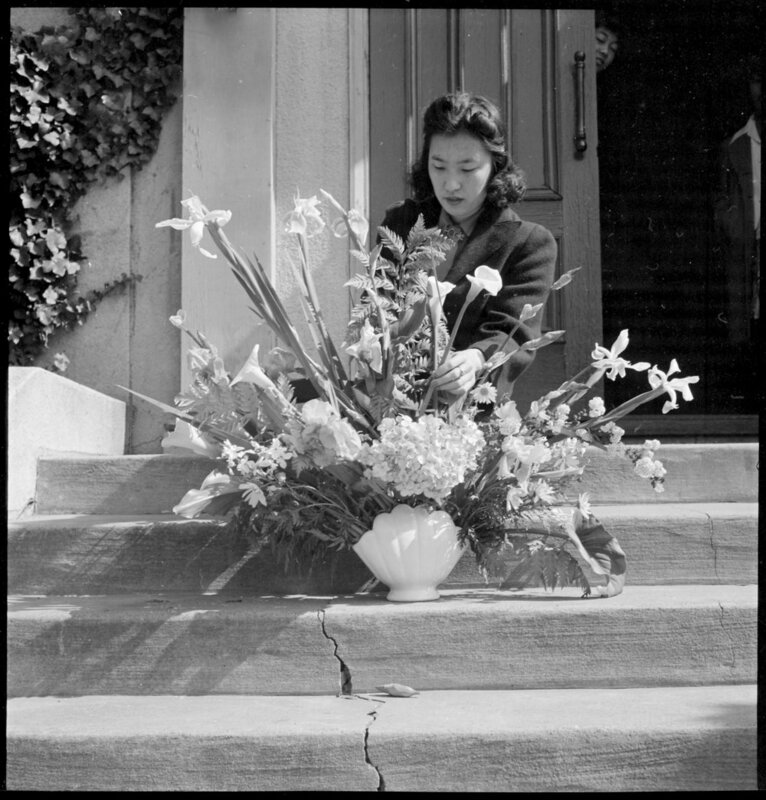 Arranging flowers for altar on last day of service at Japanese Independent Congregational Church, prior to evacuation. Evacuees of Japanese ancestry will be housed at War Relocation Authority centers for the duration. Florin, Sacramento County, California. A soldier and his mother in a strawberry field. The soldier, age 23, volunteered July 10, 1941, and is stationed at Camp Leonard Wood, Missouri. He was furloughed to help his mother and family prepare for their evacuation. He is the youngest of six years children, two of them volunteers in United States Army. The mother, age 53, came from Japan 37 years ago. Her husband died 21 years ago, leaving her to raise six children. She worked in a strawbery basket factory until last year when her her children leased three acres of strawberries "so she wouldn't have to work for somebody else". The family is Buddhist. This is her youngest son. Her second son is in the army stationed at Fort Bliss. 453 families are to be evacuated from this area. Mountain View, California. Mother of six children born in this country. Before evacuation, the family operated a 20-acre farm in Santa Clara County, raising berries, broccoli, peas, and garlic. Evacuees of Japanese ancestry will be housed in War Relocation Authority centers for the duration where they will be given opprtunities to continue farming and other callings. Centerville, California. Hands of woman farm- worker preparing soil for transplanting tomato plants, in a field in Alameda County, California, several weeks before evacuation. Farmers and other evacuees of Japanese ancestry will be given opportunities to follow their callings in War Relocation Authority centers where they will spend the duration. Stockton, California. Weeding celery field in the Delta region, prior to evacuation. Henry Futamachi, ranch manager, in foreground. Farmers and other evacuees of Japanese ancestry will be given opportunities to follow their callings in War Relocation Authority centers where they will spend the duration. Mountain View, California. 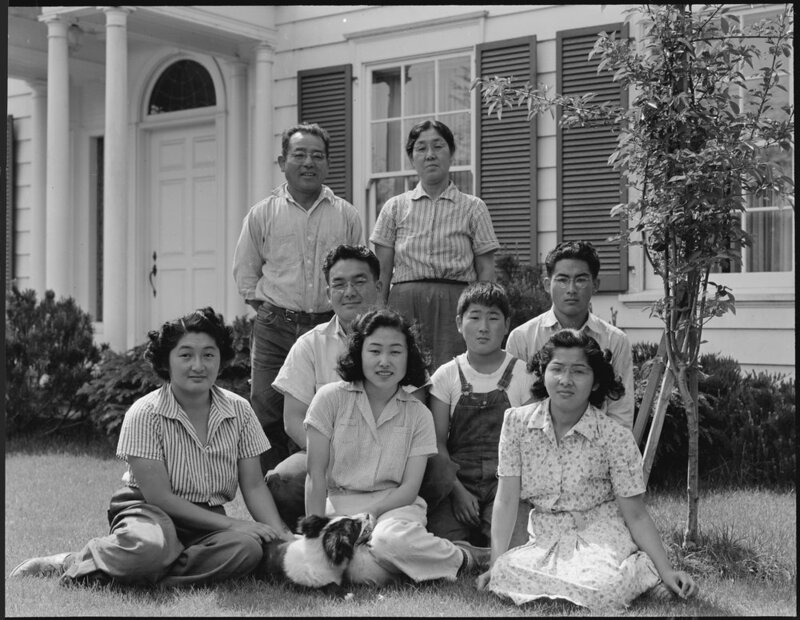 Henry Mitarai, age 36, successful large-scale farm operator with his family on the steps of their ranch home, about six weeks before evacuation. This family, along with others of Japanese ancestry, will spend the duration at War Relocation Authority centers. PRINT AVAILABLE Mountain View, California. 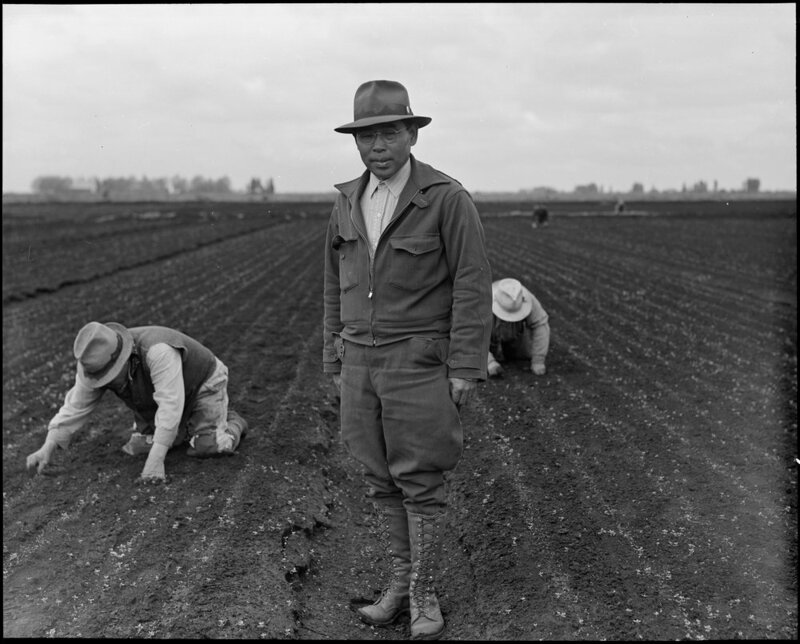 Henry Mitarai, 36, in one of his sugar beet fields on his mechanized farm, prior to evacuation. His payroll ran as much as 8,000.00 a year. Farmers and other evacuees of Japanese descent will be given opportunities to follow their callings at War Relocation Authority centers where they will spend the duration. The Japanese race is an enemy race and while many second and third generation Japanese born on American soil, possessed of American citizenship, have be come ‘Americanized,’ the racial strains are undiluted. PRINT AVAILABLE April 20, 1942 — San Francisco, California. Many children of Japanese ancestry attended Raphael Weill public School, Geary and Buchanan Streets, prior to evacuation. This scene shows first- graders during flag pledge ceremony. Evacuees of Japanese ancestry will be housed in War Relocation Authority centers for the duration. Provision will be effected for the continuance of education. PRINT AVAILABLE April 20, 1942 — San Francisco, California. Flag of allegiance pledge at Raphael Weill Public School, Geary and Buchanan Streets. 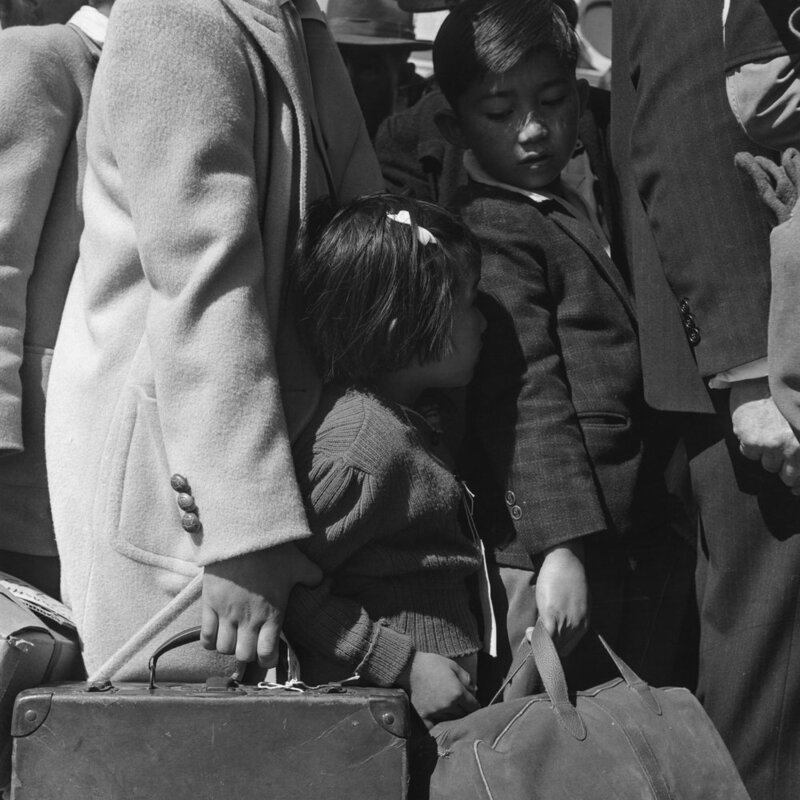 Children in families of Japanese ancestry were evacuated with their parents and will be housed for the duration in War Relocation Authority centers where facilities will be provided for them to continue their education. PRINT AVAILABLE May 9, 1942 — Centerville, California. This youngster is awaiting evacuation bus. Evacuees of Japanese ancestry will be housed in War Relocation Authority centers for the duration. PRINT AVAILABLE April 29, 1942 — San Francisco, California. 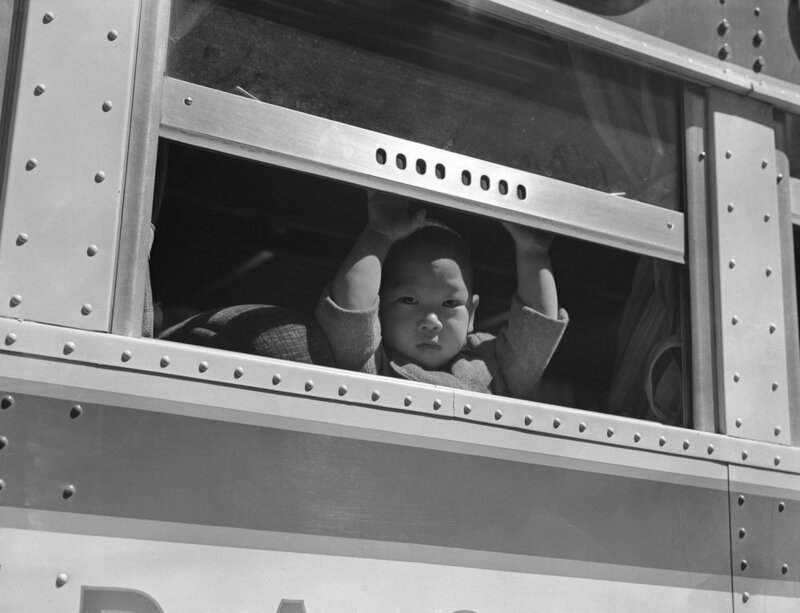 A young evacuee looks out the window of bus before it starts for Tanforan Assembly center. Evacuees will be transferred to War Relocation Authority centers for the duration. May 20, 1942 — Woodland, Yolo County, California. Ten cars of evacuees of Japanese ancestry are now aboard and the doors are closed. Their Caucasian friends and the staff of the Wartime Civil Control Administration stations are watching the departure from the platform. Evacuees are leaving their homes and ranches, in a rich agricultural district, bound for Merced Assembly Center about 125 miles away. May 20, 1942 — Woodland, California. Families of Japanese ancestry with their baggage at railroad station awaiting the arrival of special train which will take them to the Merced Assembly center, 125 miles away. May 19, 1942 — Stockton, California. Noon on a hot day at the Stockton Assembly center, which is a converted fairgrounds. This photograph shows the old race track. This center has been opened a week and evacuees will arrive daily until the capacity of 5000 is reached. 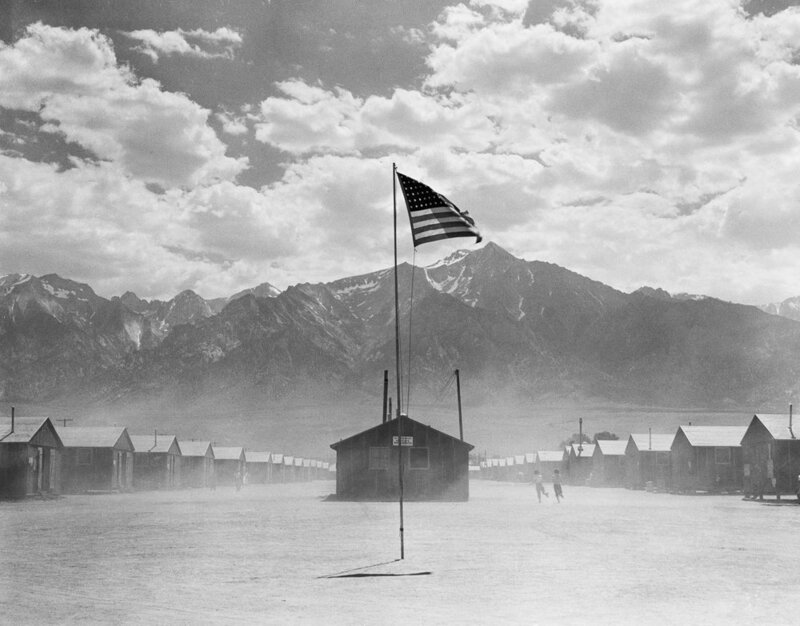 When we got to Manzanar, it was getting dark and we were given numbers first. We went down to the mess hall, and I remember the first meal we were given in those tin plates and tin cups. It was canned wieners and canned spinach. It was all the food we had, and then after finishing that we were taken to our barracks. PRINT AVAILABLE July 3, 1942 — Manzanar, California. Dust storm at this War Relocation Authority center where evacuees of Japanese ancestry are spending the duration. June 16, 1942 — San Bruno, California. Supper time! Meal times are the big events of the day within an assembly center. This is a line-up of evacuees waiting for the "B" shift at 5:45 pm. They carry with them their own dishes and cutlery in bags to protect them from the dust. They, themselves, individually wash their own dishes after each meal, since dish washing facilities in the mess halls proved inadequate. Most of the residents prefer this second shift because they sometimes get second helpings, but the groups are rotated each week. There are eighteen mess halls in camp which, together, accomodate 8,000 persons three times a day. All food is prepared and served by evacuees. PRINT AVAILABLE July 2, 1942 — Manzanar Relocation Center, Manzanar, California. Little evacuee of Japanese ancestry gets a haircut. PRINT AVAILABLE June 30, 1942 — Manzanar Relocation Center, Manzanar, California. 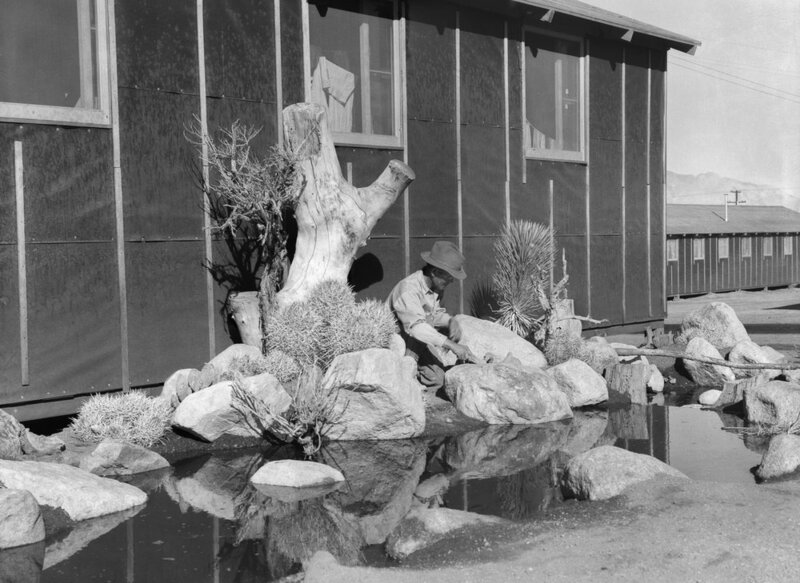 William Katsuki, former professional landscape gardener for large estates in Southern California, demonstrates his skill and ingenuity in creating from materials close at hand, a desert garden alongside his home in the barracks at this War Relocation Authority center. PRINT AVAILABLE July 1, 1942 — Manzanar Relocation Center, Manzanar, California. Making camouflage nets for the War Department. This is one of several War and Navy Department projects carried on by persons of Japanese ancestry in relocation centers. 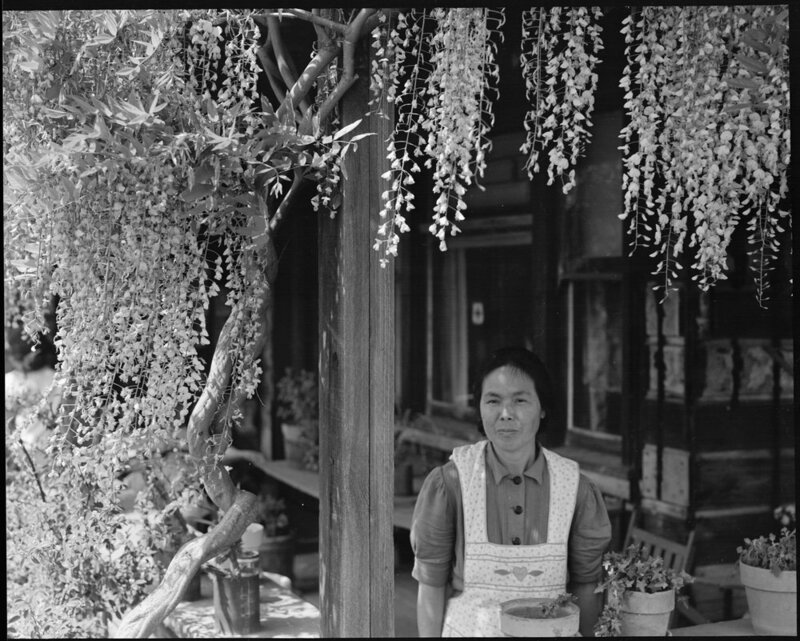 PRINT AVAILABLE June 28, 1942 — Manzanar Relocation Center, Manzanar, California. Guayule beds in the lath house at the Manzanar Relocation Center. PRINT AVAILABLE May 20, 1942 — Woodland, California. 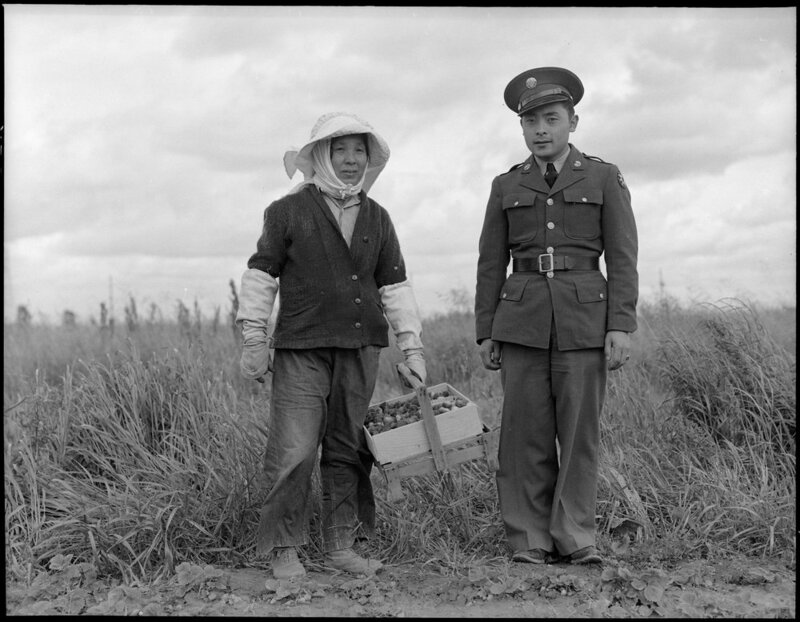 Tenant farmer of Japanese ancestry who has just completed settlement of their affairs and everything is packed ready for evacuation on the following morning to an assembly center.